The Colorado Avalanche kicked off their rookie tournament in Las Vegas against the host Golden Knights, and were immediately shelled. After falling behind 5-0 after one period, the youngsters managed to recover and show a little resiliency. While they were unable to fully recover from the early deficit, they did manage to make a game of it but ended up losing 7-6 to the Golden Knights. Martin Kaut made his debut in an Avalanche uniform and had a rough start. After hustling to negate an icing on his first shift, he took a high sticking penalty that allowed Vegas to get on the board early. The rest of his game left a lot to be desired, as he didn’t look eager to hold onto the puck, and when he did, didn’t make the best decisions. It’s only one game and like the rest of the team, he had a bit more jump late. Vladislav Kamenev, who wore the “C” on the ice, had a disappointing night. He had some good moments of patience with the puck in the first period, but for the most part didn’t look like a guy who is older and more talented than the majority of the players on the ice. He did pick up an assist late in the game, but a guy with his skill and experience should dominate this tournament, and he certainly did not do that tonight. Petr Kvaca did not get a lot of help from the defense in front of him, but he didn’t do a whole lot to instill confidence in Avs fans that he may have a future in Colorado. He gave up six goals in just 30 minutes, and didn’t really make any big saves. His glove hand, in particular, looked susceptible and he was beat glove side on most of the goals. If there was one player whose stock rose substantially in just one game, it was Logan O’Connor. 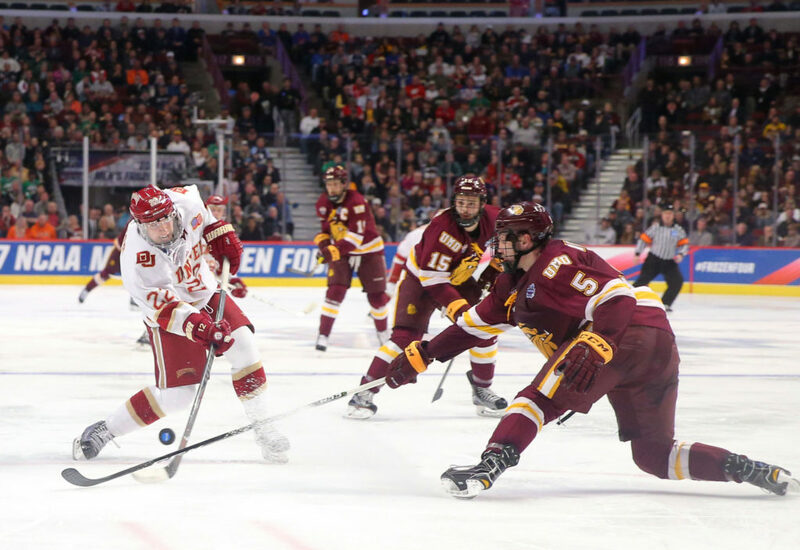 The free agent pickup, who was set to be DU’s Captain this coming year before signing, managed to collect two goals on the evening, as well as an assist. He is a strong skater and used that speed on the forecheck. The second goal was a nice display of skill, as he toe dragged around the defenseman and managed to get his own rebound before putting it past the goaltender. He’s a little older than most prospects in this tournament so he has an advantage there, but his hustle will catch the eye of Avs coaches in main camp. The defense, in general, had a very tough night, struggling to move the puck out of their own end and getting caught flat footed a few times. Josh Anderson has improved his skating since being drafted, but still has major issues with the puck that were on display this evening. Without Cale Makar and Conor Timmins, the Avs are without their top prospects on the blue line, and there wasn’t a whole lot to be excited about in game one. Brandon Saigeon, a fifth round draft pick this summer, collected two goals in the third period, both on rebounds by crashing the net. Drafted as a 20 year old, the youngster is eligible to sign and play immediately in the AHL, but has yet to sign a contract with Colorado. If he doesn’t sign in Colorado, he’ll head back to the OHL for his overage season. The two goals on the evening might have helped him move a little closer to his first professional contract. Greg Cronin, the new Head Coach of the Colorado Eagles, was not on the bench this evening, nor was he on the ice with the rookies yesterday in Colorado. The Eagles head coach last season, Aaron Schneekloth, was behind the bench running the show. Ty Lewis, an undrafted free agent who earned a contract from the Avalanche last year, had a good showing, collecting a goal and picking up an assist in the second period. His skating was on display most of the evening, and was one of the few bright spots early in the game when the Avs were taking a beating. Although he is eligible, it would seem unlikely he heads back to the WHL. The Avalanche rookies are back on the ice tomorrow evening when they take on the Anaheim Ducks. The game starts at 6 PM MST, and there should be a stream available.